Wednesday Connections has changed! In response to the changing demographics and schedules of our members, we’re trying some new things and invite you to check it out. In September, we launched our first experience of “Dinner Church.” Dinner Church is inspired by an innovation of St. Lydia’s Church in Brooklyn, New York, and picked up by the Luther Seminary Community. Based on the worship in the Early Church, where in the second and third centuries, Christians gathered for sacred meals they called the Eucharist (a Greek word that means “thanksgiving”). The meals shared by these early Christians were the great-great...great-great grandparent of our modern Eucharist, also called Communion or the Lord’s Supper. Here’s how Dinner Church looks at Our Saviour’s. 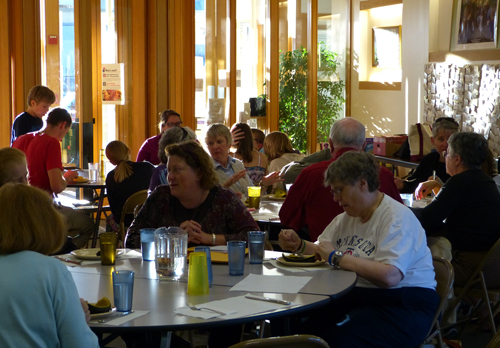 Members, friends, and visitors of all ages gather at 5:30p to share a simple meal. As the meal is drawing to a close, we begin with some simple singing, sharing of our joys and sorrows at individual tables, and a time of prayer with candle lighting. Children age three and above are then sent off to Godly Play. Younger children are invited to remain at their tables or roam and play in the Hospitality Center as the worship continues. A passage of scripture is read, and participants engage in conversation and reflection on the passage according to the resource available at each table. After a time of study, we come together again to share in Holy Communion. With song and prayer, we remember that Jesus shared this meal with his disciples. Bread and wine (also gluten free wafers and juice) are placed at each table, and participants serve the elements to each other. This simple service ends with song, blessing, and sharing of the peace. The gathered community shares in the clean-up from both meals we have shared, and all is complete when the children are finished with Godly Play. It is our hope that Dinner Church will provide a less formal worship experience at an alternative time to Sunday morning, and offer a means of forming deeper relationships as we share in Word and Meal. Dinner Church will be offered on the second Wednesday in October, November, January and February, and will be the shape of our weekly midweek worship during the seasons of Advent and Lent. Come, partake, and help us continue to develop and fine tune this special service.